Directions for use Use as part of your baby's daily oral care routine and after meals and snacks. Place around index finger and wipe around gums, tongue and cheeks. 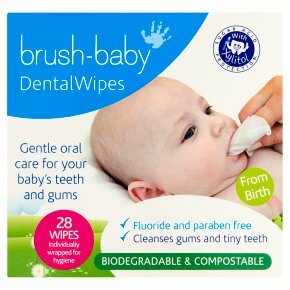 Wipe around all surfaces of new baby teeth. Do not use water, no rinsing necessary. Dispose after one use. Introduce brushing as your baby gets teeth. Caution<br>Do not flush. Keep out of reach of small children. Choking hazard. Do not chew. Do not let children use unattended. Do not use if allergic or sensitive to any of the ingredients.